The Federal Government has said that the release of the Dapchi schoolgirls by Boko Haram terrorists was unconditional. 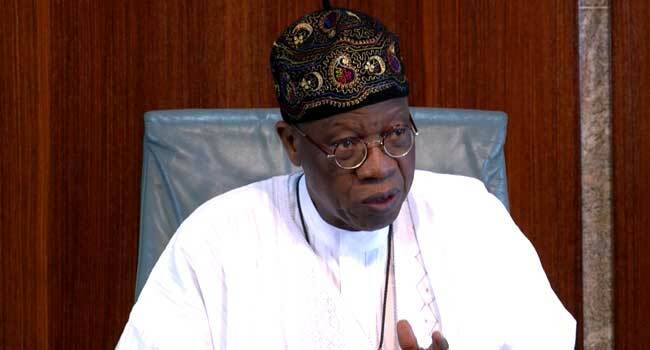 Minister of Information and Culture, Mr Lai Mohammed, said this in a statement by his media aide Segun Adeyemi in Abuja on Wednesday, hours after the girls were released by their abductors. While the parents of the missing girls and others celebrate their return, the minister confirmed that at least 76 of the 110 abducted students were released. He stressed further that the development was in line with the directive by President Muhammadu Buhari to all security agencies to do everything possible to secure the release of the Dapchi schoolgirls. Mr Mohammed noted that the release of the abducted students is ongoing, just as the girls who returned are those who have been documented so far. According to him, the girls were released in the wee hours of Wednesday through back-channel efforts and with the help of some friends of the country. Meanwhile, some Nigerians have questioned how the girls were returned and their abductors were not apprehended by security agencies. In his response, the information minister explained that “for the release to work, the government had a clear understanding that violence and confrontation would not be the way out as it could endanger the lives of the girls, hence a non-violent approach was the preferred option. “Within the period when the girls were being brought back, operational pause was observed in certain areas to ensure free passage and also that lives were not lost,” he added. Mohammed, however, said that the number of the freed girls would be updated after the remaining ones have been documented, especially because the girls were not handed over to anyone but dropped off in Dapchi.